European forex investors enjoyed a breath of fresh air yesterday as economic confidence in the common area moved up, giving the euro a boost. As such, the EUR/USD pair climbed 107 points to $1.3047, with some analysts even rushing to announce Europe's emergence from its long recession. Confidence in Germany, Europe's biggest economy, seems to be on the rise after the ECB cut interest rates earlier this month. At the same time, following a 0.7% contraction at the end of 2012, the country's 0.1% growth for the first quarter is helping to add support to the overall perception of the Eurozone. As a result, the euro has been rather resilient on the spread trading markets, rebounding 85 points yesterday to $1.2940. Yesterday's slump of 72 points for the EUR/USD pair to $1.2856 came as better news for the US economy sent FX investors into the dollar rather than on bad news for the shared currency. However, with the Eurozone still playing catch up in terms of recovery, a retest of support at the $1.28 level is a distinct possibility. Carmakers in Europe posted some surprisingly good results which allowed for a rebound in European equities following last week's decline. However, with the UK market closed for a bank holiday, the good news did not translate into a positive attitude towards the common currency. 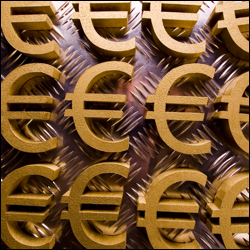 The euro-dollar forex pair was rather flat for most of the day, ending just 7 points lower at $1.2928. Although it's too early to say if the Eurozone has turned a corner from its record-long recession, consumer confidence seems to be on the rise. At the same, we saw some improved manufacturing numbers which also supported traders' optimism. Consequently, the shared currency moved higher, with the EUR/USD pair gaining 75 points to $1.2932. With so much expectation about a possible tightening of monetary policy, Bernanke opened by presenting the dangers of destroying the green shoots. Nevertheless, went on to say that a sustained recovery in the global markets could support the case for less asset purchases. So, after a brief rally, the euro retraced versus the dollar, closing 47 points lower at $1.2858. The risk-on mood in the currency arena was sparked by speculation that, despite rumours over a potential exit strategy, the pro-QE camp might still have the upper hand in the US. As a result, investors moved into the euro, pushing it 23 points higher to $1.2905, in what seems to be a cautiously optimistic approach.